Apart from showcasing or announcing liturgies that feature fine examples of it, I've noticed that NLM hasn’t been talking much lately about sacred music. This surely isn’t because the subject is not hugely important. Part of the reason, I think, is that sacred music is so massively and thoroughly important that it is hard to know where to begin. Music is the very language of the soul, its most intimate and exalted expression. Sacred music is the blood and bone of the liturgy, the carrier of its organic life, the texture of its being, the architecture of its prayer. If something goes wrong with music, as Plato saw long ago, the culture is lost. If something goes wrong with liturgical music, as Ratzinger saw so clearly, the cultus is depressed and devalued. It is like arguing about the sanctity of human life, or heterosexual marriage: if it isn’t obvious to you that a child is a person with dignity or that only a man and a woman can marry, then where can our argument go next? There are some things so basic, so close, so intimate, so all-pervasive, that we do not know where to begin, and once begun, we hardly know where to end. Music, and liturgical music, is just like that. Well, that’s all true, as far as it goes — but it’s absolutely not a reason to stop the conversation or to stop the grassroots efforts for revitalizing our Church’s musical life, which, in general, is still at a deplorable level. There are still people who desire to learn about authentic sacred music. There are men and women of good will ready to embrace the Church’s heritage if only it is introduced to them. There are friends to be made and foes to be converted. There are new insights to share and new ways to explain or apply old principles. It is a subject that must not be allowed to descend into the realm of unspoken assumptions but rather must be, again and again, brought into the light. Doing so benefits both those who love sacred music and those who may come to love it if only we are tireless in making the case for it. Now, the case must be made in two ways. First, in words, as writers have done at NLM and Chant Café and elsewhere. Second, through the introduction and good practice of sacred music in the parish. Precisely because we are dealing with the phenomenon of music, experience is of far greater weight than words. The experience of genuinely beautiful sacred music has its own way of touching minds and hearts, although I am not going to suggest that it will always be easy, automatic, or instantaneous for everyone. So, we need to take whatever opportunities we can find to convince pastors and especially bishops to develop a great concern for the state of music in the Church and to espouse concrete steps of renewal. A shining example in this regard is the pastoral letter Rejoice in the Lord Always of Archbishop Alexander K. Sample, which he issued when bishop of the Diocese of Marquette. In promulgating this document, with its clear explanations and actual legislation for parishes, His Excellency combined the two ways mentioned above: he put the mind of the Church into writing, and, using his episcopal authority, introduced diocesan laws that would establish sacred music at the parish level so that the Catholics of his diocese could at last, in accord with Vatican II’s Sacrosanctum Concilium, experience the primacy of chant and of other music from the Church’s priceless patrimony. As with last week’s model letter on restoring all-male altar service, what follows is a model or template of the sort of letter that a bishop or other superior might consider sending to his clergy, in pursuit of the liturgical renewal so eloquently called for and expounded in Benedict XVI’s timeless writings. This letter briefly addresses the desperate need for elevating the style and quality of music in parishes. May it be helpful in some way to all pastors who are striving to purge what is unworthy of the temple of God and reestablish excellence in sacred music! “Let nothing be preferred to the Work of God,” as St. Benedict memorably says in his Holy Rule. The Father of Western Monasticism left us a clear reminder that, whether we are monks or not, the service of our Lord in the divine liturgy (what Benedict called the opus Dei) is our principal task while on earth, our greatest responsibility before the Creator of heaven and earth, the most profound source of our sanctification, and a work of love handed down from ages past into which it is our joy to initiate each new generation of believers. Unfortunately, in the decades following the Council, it seemed as if many in the Church became confused. They ran away from this primary task and got preoccupied with what may have been important but was certainly secondary. Their gaze on the sovereign work of the Lord grew weak, and soon they treated the most sacred mysteries in a casual and irreverent way. Many of the treasures of our faith were forgotten or repudiated in the mistaken view that they had nothing to say to modern people. Pope John Paul II and Pope Benedict XVI worked tirelessly against the secularization and forgetfulness of God that simultaneously affected the realms of doctrine, morals, and worship. As all can see, the unraveling of Western society and a corresponding disorientation in the Church have, by now, reached crisis proportions. As pastors, it is our duty to avoid anything that may contribute to this process of self-destruction and to promote, in a clear-sighted and principled way, the sanctification and salvation of the faithful entrusted to our care. To do so, we must first of all be consistent with our Catholic tradition and with the Magisterium of the Church. Any Catholic church should be, and look and sound like, a microcosm of the one Catholic church; the same is true of the liturgy. That is why the Instruction Redemptionis Sacramentum can say: “It is the right of the community of Christ’s faithful that especially in the Sunday celebration there should customarily be true and suitable sacred music” (n. 57). In accordance with the teaching of the Second Vatican Council — “steps should be taken so that the faithful may also be able to say or to sing together in Latin those parts of the Ordinary of the Mass which pertain to them” (Constitution on the Sacred Liturgy Sacrosanctum Concilium, n. 54); “the musical tradition of the universal Church is a treasure of inestimable value, greater even than that of any other art” (SC 112); “the treasure of sacred music is to be preserved and fostered with great care” (SC 114); “the Church acknowledges Gregorian chant as specially suited to the Roman liturgy: therefore, other things being equal, it should be given pride of place in liturgical services” (SC 116) — as well as the constant teaching of the Sovereign Pontiffs from St. Pius X down through Benedict XVI, I shall require pastors and music ministers to expand the use of, or to reintroduce if they have fallen into disuse, chanted proper antiphons and chants for the Ordinary of the Mass. This, too, is fully consistent with the advice of the USCCB in Sing to the Lord: Music in Divine Worship (see, inter alia, nn. 30, 61, 72-80, 117). The “Propers” of the Mass — at very least, in the realm of the Ordinary Form, the Introit or Entrance antiphon, Offertory antiphon, and Communion antiphon — are an integral part of the Roman Rite of Mass and ought to be prominent, as indeed is suggested by their primacy in the General Instruction (see GIRM, nn. 48, 74, 87). The immense scriptural and theological riches of the Proper texts given in the official liturgical books and the wonderful congruency of chanted antiphons with the liturgical action for which they are intended recommends them above all other texts and types of music. While it is possible and at times desirable to use just the proper antiphons with their verses, it is certainly permissible to chant the antiphon and then sing a suitable motet or congregational hymn; I leave the particulars to your own judgment, which must take into account the abilities of the singers and the sensibilities of the faithful. What I am requiring is that the antiphons always be sung at the principal Masses of Sundays and Holy Days, whatever else may be sung. The “Ordinary” of the Mass — the Kyrie, the Gloria, the Creed, the Sanctus, the Agnus Dei, the Lord’s Prayer, and the dialogues between priest and people — is likewise to be sung on these days, in English or in Latin (Greek for the Kyrie). When the Ordinary is sung in English, preference should be given to modal melodies that have the characteristics of plainchant. Naturally, it takes time to learn a number of chants, so it may be best to start with a certain core, such as the Kyrie, Sanctus, and Agnus Dei, and add to it as time goes on. Gregorian chant is not simply one style of church music among many; it is the music of the Roman rite par excellence, and therefore has a certain primacy. Pope Benedict XVI asked us to rediscover our tradition and, at long last, to implement what Vatican II really taught (cf. Sacramentum Caritatis, n. 42). It would therefore be fully appropriate and desirable that chant be used at every Mass at which music is planned, and that we move away from artificial distinctions such as “Folk (or Youth) Mass” vs. “High Mass.” Every Mass should be reverent and sacred, as worthy as we can make it of the unfathomable gift and mystery of the Lord’s Body and Blood. 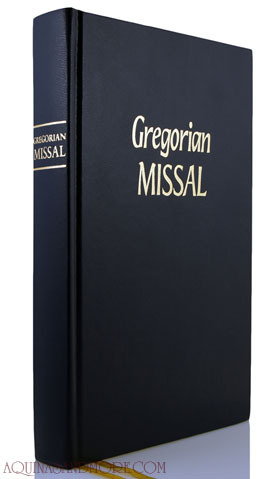 In some missalettes and in nearly all hymnals there is at least one Gregorian chant Mass, and often several, that can be employed. 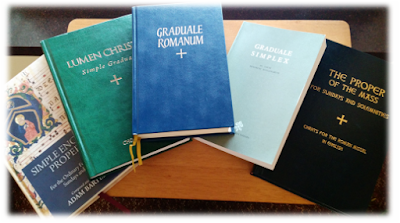 Excellent resources for expanding your parish’s use of plainchant in Latin as well as in the vernacular (English and Spanish) are available from such publishers as Ignatius Press, CanticaNova, Illuminare Publications, Corpus Christi Watershed, and St. Michael Hymnal. 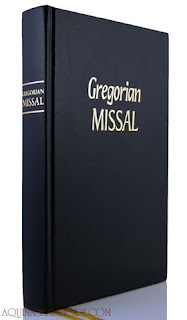 Without prejudice to other worthy publications, I do recommend taking a close look at the Lumen Christi series, The Proper of the Mass, and the Ignatius Pew Missal. As chief liturgist of the Diocese, responsible for good order and decorum in the house of God, I ask that you instruct music ministers to stand no longer in or near the sanctuary at the front of the church, but to sing from the choir loft, or, if there is no choir loft, from the back of the church. Decades of confusion and poor instructions have caused many to believe that the ideal location for musicians is at the front, visible to everyone, but this contravenes in every respect the true nature and role of the musician at Mass. Musicians are not supposed to be in the foreground but in the background; their essential contribution is to help the Christian people to meditate on the sacred mysteries, which is best accomplished by music that is itself more contemplative, not too loud, strident, or dominating. When placed front and center, singers and instrumentalists cannot avoid becoming performers and drawing attention to themselves, no matter how humble their intentions may be. 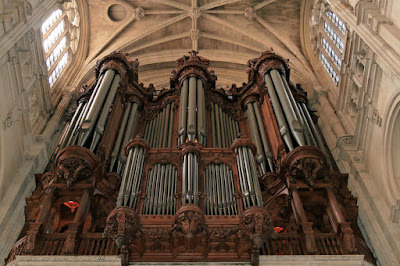 In this connection it is also important to recall, as the Popes have done into our own times, that the preferred instrument for musical accompaniment in the Roman rite is the pipe organ (cf. Vatican II, Sacrosanctum Concilium, n. 120; Pius XII, Musicae Sacrae, n. 58; Instruction Musicam Sacram, n. 63). Churches that do not have a pipe organ should be fitted with one at the nearest opportunity; alternatively, if it does not seem possible to raise the requisite funds, a high-quality keyboard programmed to sound like a pipe organ may be utilized. It will be advisable to phase out the piano and the guitar, since the Church has repeatedly taught that instruments associated with worldly music are not suited for use in the liturgy. It is true that these instruments have been around for a long time now, but their abiding cultural associations, the manner in which they tend to be played, and the style of music written for them combine to show that we are dealing not so much with the sacralization of once-secular instruments as with the secularization of once-sacred music. Accordingly, as of Christmas next year, the only instruments that may be played during the liturgy will be the pipe organ (or its digital equivalent as established by the diocese) and traditional string and wind instruments. Of course, voices by themselves are more than sufficient for the singing of the Church’s music, and the organ by itself suffices as an accompanying or a solo instrument. In pursuit of these important goals, which require professional training and continuing education, diocesan funds will be made available annually to assist in sending parish music directors, choir directors, cantors, and organists to the Sacred Music Colloquium, the Chant Intensives, and other events sponsored by the Church Music Association of America and related organizations. We are also making plans to bring teachers into the diocese for workshops on putting into practice the Council’s noble vision. Each pastor will be asked to select a certain number of musicians from his parish to attend educational events, in proportion to the size of the parish and the scope of its music program. In the next two months, the Office of Divine Worship will send you more information on these educational events, together with a list of suggested chant settings for the Ordinary of the Mass, a list of permitted hymnals and recommended music resources, and more details on the installation of pipe organs and digital organs. The requirement to reintroduce the chanted Propers and Ordinary and to alter (if necessary) the location of musicians goes into full effect as of the First Sunday of Advent, any customs to the contrary notwithstanding. By Christmas, all Propers are to be sung (either in simple tones or in fuller melodies), and all parts of the Ordinary by the feast of Candlemas, February 2. The requirement to shift to the pipe organ will go into effect as of Easter Sunday; the long-standing tradition of utilizing no musical instruments during Lent will be of assistance in this regard. The source and summit of the new evangelization will be the sacred liturgy most worthily, reverently, and beautifully celebrated, drawing upon all that is best and noblest in our Catholic tradition. This, dear priests and deacons, is a demanding and rewarding path for all of us to follow as we strive to adore the Father in spirit and in truth and to lead our people ever more deeply into the unfathomable mysteries of His love. Everything I say here about parishes would also apply to college and university chaplaincies. The full text of Rejoice in the Lord Always is here, at the website of the Diocese of Marquette. Archbishop Sample’s pastoral letter is the finest episcopal document on the subject that has appeared in the last 50 years—including in this estimation the documents of national episcopal conferences. The team of writers at Views from the Choir Loft wrote a series of appreciations of this pastoral letter: see here for the first installment and links to the rest.